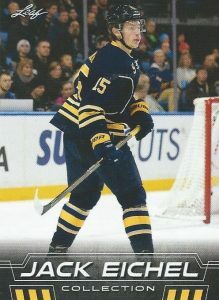 2016 Leaf Jack Eichel Collection chronicles the 19-year-old's outstanding first season in the National Hockey League with a factory set. Each commemorative box includes 30 base cards and one autograph. Selected second overall in the 2015 NHL Entry Draft, the Buffalo Sabres center had quite the rookie year. As made clear by the set, there are plenty of moments to celebrate in his first 81 games. Eichel scored a total of 24 goals, with five being game-winners, and totaled 56 points with 32 assists. When he notched his first goal in October of the 2015-16 NHL season, Eichel became the youngest scorer in team history. Jack Eichel was also chosen for the '15-16 NHL All-Rookie team. 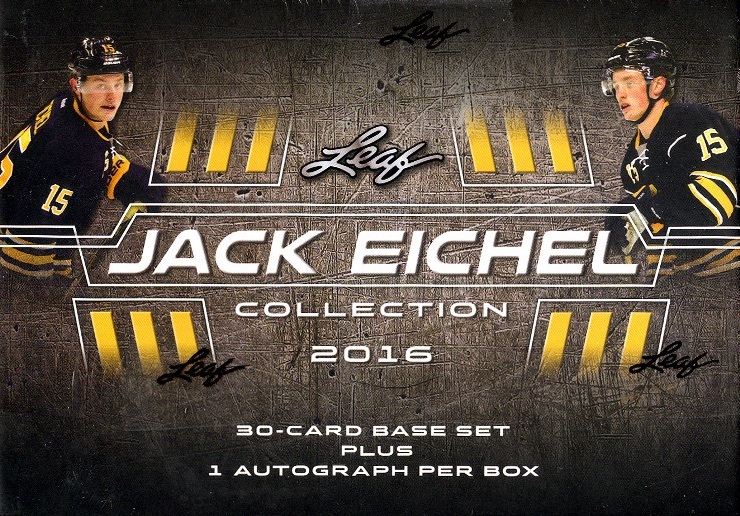 2016 Leaf Jack Eichel Collection features 30 base cards highlighting the Massachusetts native's debut season. Every box contains the full base set. The main attraction for most collectors is the on-card Autograph cards which are all serial numbered. The signed cards fall in every box and also have low-numbered parallels as limited as one-of-one. While the exact production was not disclosed, 2016 Leaf Jack Eichel Collection looks to be fairly limited as a print-to-order release. 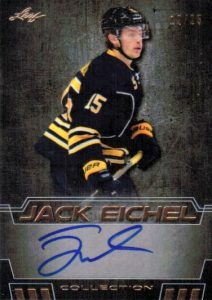 2016 Genesis Jack Eichel Autograph 10 New Dawn Leaf SP Rookie SSP !!!! 2015 Leaf Q Jack Eichel autograph Printing Plate Yellow #'d 1 1! 30 cards. Shop base cards on eBay. 30 cards. 1 per box set. Base Bronze is serial numbered #/25. PARALLEL CARDS: Red Foil #/15, Blue Foil #/10, Silver Foil #/5, Gold Foil 1/1.